Assessing your band students’ sight-reading and performance skills is a laborious and time-consuming task. But how else can you confirm and document student achievement to yourself and your administration? What if there were an accurate and effective assessment tool at your fingertips that didn’t require you to be one-on-one with each player? There is: You Won’t Miss A Beat™ Band Assessments allow you to continue conducting your ensembles while we digitally assess your players individually. 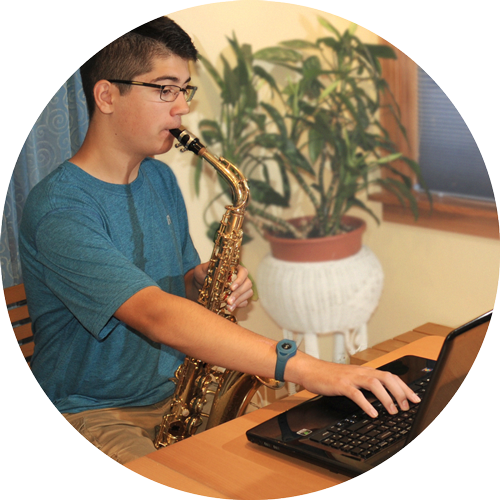 Three times per year, on a schedule of your choosing, your students leave the ensemble one by one, enter a practice room where you have set up a computer or laptop, take their assessment, then return to the ensemble a few moments later. Students receive instant feedback and the results are immediately scored, graphed, and available at your desktop to interpret and share with parents and administrators. Accurate assessments have direct benefits for your band performers, too: Knowing where they stand and how they’re improving can motivate students to practice even harder. When students see progress their desire to learn more increases and your work load and stress levels go down! You Won’t Miss A Beat Band Assessments are priced for individual schools, entire departments, and entire school districts. The 120 instrumental assessments increase in difficulty from beginners, to quite challenging for advanced players. As difficulty increases the assessments also increase in duration. The assessments are entirely unison, transposed to appropriate octaves for the entire band. Notes appear in the assessments in the same order introduced in the various beginning band textbooks: D E-flat, F, C, B-flat, G, etc. Great care is taken getting clarinets “over the break” in assessment 12. Major and minor key signatures, various rhythms, and meters follow. After assessment 15, the entire chromatic scale is in regular use. Assessment 40 in the key of A harmonic minor is written at the 2+ or 3- level you would expect a third of the way through the 120 assessments. It stresses pairs of 8th notes and pairs of 16ths in five clear 4-measure phrases, each phrase with a slight rhythmic variant at the end. Notice the two 16ths are always on a single pitch at this level in this highly rhythmic setting. The 8th note pairs begin on the same note, but by the final phrase are different notes, with the 8ths-16ths rhythms mixed. The initial two phrases are rhythmically identical, but on different notes. The third and fourth phrases have nearly identical rhythms, with inverted melodies. The final phrase reprises the initial phrase with similar but not identical notes leading to the end. The intent was to create a playful and happy (and yet sadly minor) assessment with rhythms never fully predictable, including pairs of 16ths always on a single pitch.